You’re most welcome to visit our hire shop for your bicycle allocation, or we’ll even take the guesswork out of bicycle delivery by providing an optional luxury bus pick-up service, delivering you & your friends from your local accommodation or meeting place to our hire facility. 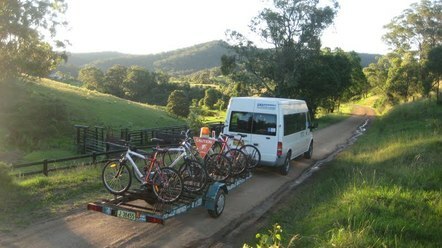 This will ensure correct fitment of cycle & helmet, and provide you with the ideal location to commence your Hunter Valley cycling adventure. All hires include bicycle, helmet, bottled water, sunscreen, suggested tour map and, of course, roadside assistance. Our opening hours are 10.00am – 6.00pm, Wednesday to Sunday (inclusive).